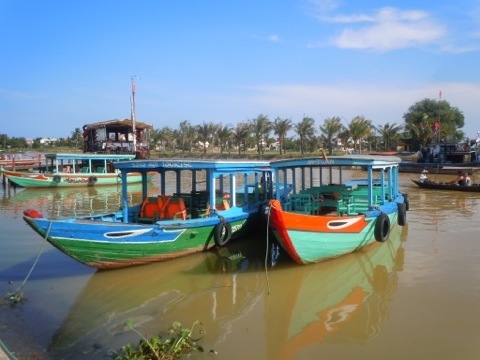 Hoi An, a charming town located about an hour’s ride from Da Nang, is picturesque and evokes a sense of a sleepy village–an impression born of the colonial architecture that ranges from Japanese to French. The old town center is small, maybe three streets, but it’s packed with market stalls, shops and restaurants. 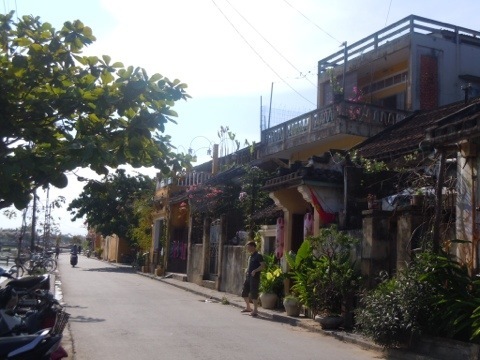 Just walking around, exploring the little alleys and shops is a treat. 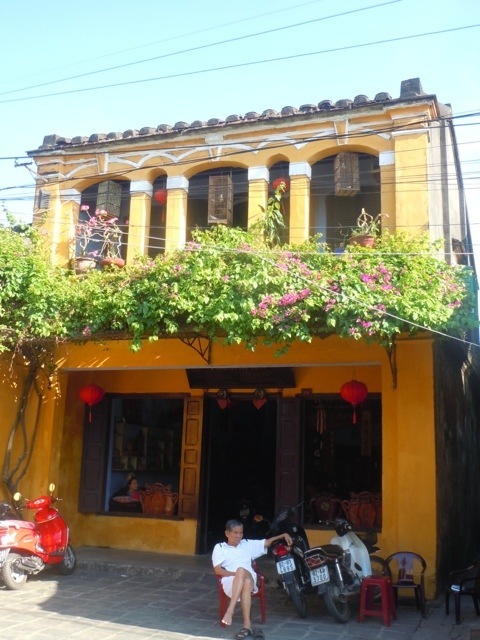 Hoi An is known as the silk capital of Vietnam and the stores offer a dazzling array of brightly colored examples. 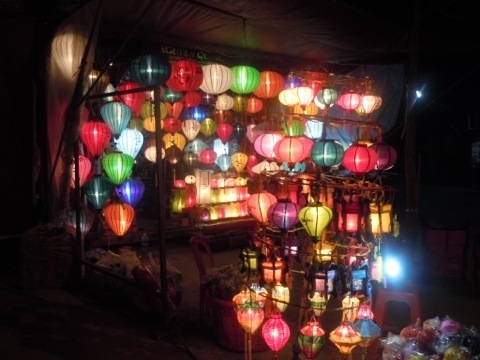 Silk lanterns are everywhere; take a walk to the night market just to marvel at the jewel-toned orbs hanging in profusion in the stalls. 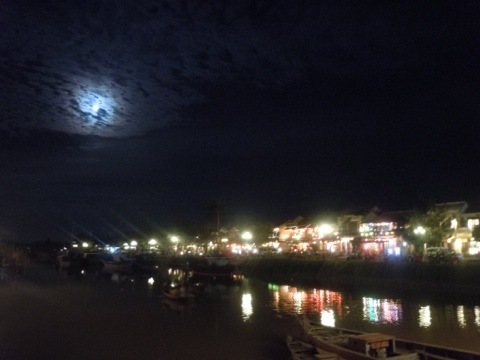 If you happen to time your visit with the full moon (which we missed by a night), the town turns off the electric lights and the streets are lit with lanterns. 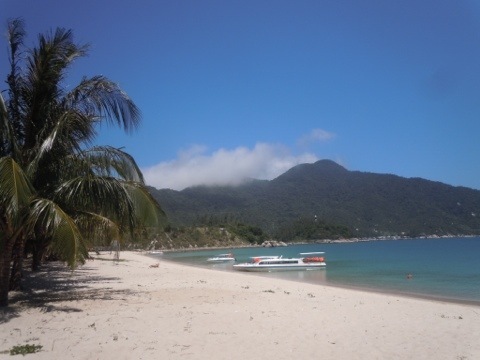 While the bulk of diving in Vietnam takes place further south in Nha Trang or Phuket Quoc Island, Brian spotted a brochure for Blue Coral diving and made the mistake of telling me about it. Sites around the Cham Islands are the northernmost sites in Vietnam, so I jumped at the opportunity to dive here. The company offers trips for both divers and snorkelers and the bulk of the 14 or so people on the boat were snorkelers. 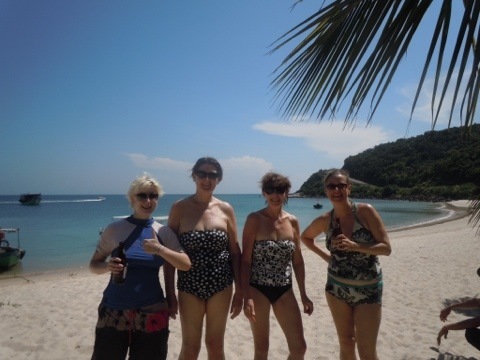 There was a group of four very funny ladies from Scotland, Wales and England with whom I chatted with on the boat ride to the Islands. My dive buddy, Patrick, a 12 year old from the UK who had already been diving with the crew for several days, and I suited up with dive master Del warning me that the water was cold…and that I should wear a shortie over my full suit. Ugh. The diving was good–not great, but good. Visibility was decent and there was some amazing coral, but not much wildlife. I did see a lion fish, native in these waters, and lots of banded coral shrimp and nudibranchs. I was thrilled, though, just to have the opportunity to get underwater again, especially in a country like Vietnam. I really didn’t know what to expect, but it was a great overall experience. Diving was relaxing, the current provided a nice drift, but Del was right–I was really happy to have two suits on. We pulled up to the largest island in the chain for lunch and some relaxing before heading back. The beach was pristine and gorgeous–the shore literally sparkled with the minerals interspersed with the sand. It was an idyllic setting in which to while away a few hours. Heather and Brian had their own beach day while I was underwater, renting bikes and cycling to Cua Dai Beach for the day. 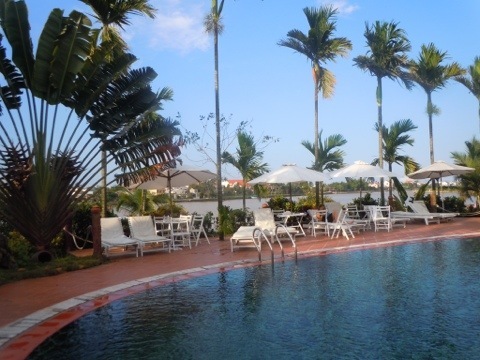 We met up that afternoon at the pool at the Pho Hoi Riverside Resort, where we were staying, and compared notes. 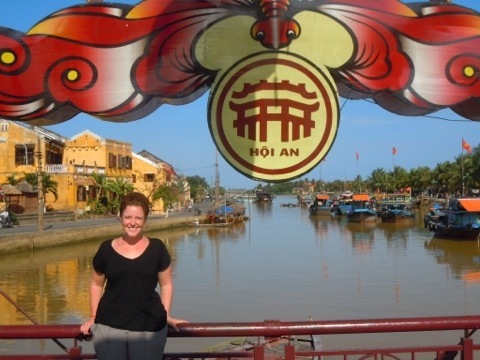 There is no lack of great food in Hoi An. We highly recommend enjoying dessert from the pastry case at Cargo Club and Mr. Kim at Cafe Des Amis is a treasure. After taking a seat, you simply let Mr. Kim know if you’re in the mood for meat, seafood or vegetarian. He takes over from there. Banh bao, or white roses, came first; then a savory soup. Our main courses consisted of grilled squid with various vegetables for me, and a ceviche-like concoction of baby shark for Heather. Brian’s meal was entirely different as he had ordered the meat choice. Not only was the food amazing, but Mr. Kim also showed us the correct way to eat it to enjoy the full experience–the instruction was greatly appreciated. One avid Aussie who was enjoying his own meal beside us told us that he had eaten there every night for the past week and hadn’t had the same thing twice. We were just sorry that we had to leave the following day without coming back for seconds. 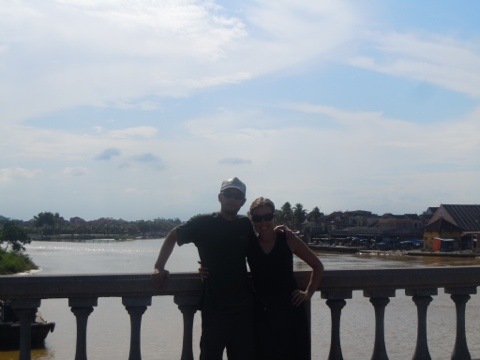 Hoi An, though decidedly a tourist destination, has enough charm and personality to overcome the throngs of people searching for deals on custom-made suits. It’s definitely worth a visit of a few nights, though I could easily spend the better part of a week there, sampling the cuisine and poking around the cobblestone streets. *Full disclosure. I would have spent more money on clothing if I hadn’t given my money to Brian and told him not to let me spend it. I admit it–I have a problem. He did a great job, too, just looking at me with this disappointed look on his face when I asked for it, shaking his head. It seriously kept me in check, for which my back, carrying my loaded pack, is sincerely grateful. 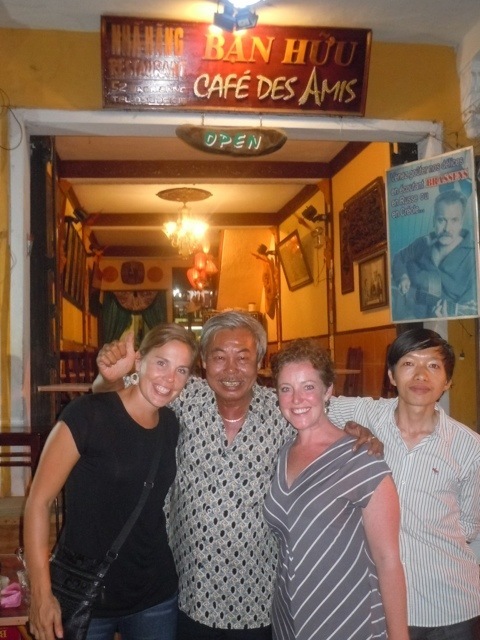 Tags: Diving, hoi an, Market, scuba, silk, Vietnam. Bookmark the permalink.